The Twelfth Amendment came from the 1800 election between John Adams and Thomas Jefferson. At the time there was no separate ballot for President and Vice President – each party nominated two candidates, and the second-place man in the pair served as VP when all was said and done. When the electoral college voted, Jefferson and his running mate Aaron Burr each came up with 73 electoral votes; so under Article II of the Constitution the matter went to a “contingent election” vote in the House. After a week’s worth of balloting, one nasty D.C. snowstorm, a lot of Federalist maneuvering and panic over possible government shutdown, Thomas Jefferson emerged as President. In 1803 the Twelfth Amendment was proposed to put some guardrails around the process. And yet there was more drama. In the 1824 presidential election, four candidates all ran as Democratic-Republicans: Senator and war hero Andrew Jackson, Secretary of State John Quincy Adams, Secretary of the Treasury William H. Crawford, and Speaker of the House Henry Clay. With four big names running on the same party ticket, no one of them was able to win the necessary majority of electoral votes. While Jackson had the plurality of popular and electoral votes, the House of Representatives went on to elect John Quincy Adams as the nation’s sixth president through contingent election. Jackson’s angry supporters alleged that House Speaker Clay had brokered a deal by which he’d throw his valuable support behind second-place Adams in exchange for the Secretary of State job. (When historians are kicking back at happy hour they call this one the “Corrupt Bargain.”) History has never proven whether there in fact was a shady deal, or whether Jackson’s anger was just sour grapes, but in any event the bad feelings over this election set Old Hickory steaming towards victory in the 1828 election. In the current two-party system, a majority of electoral votes has rarely been a problem – we haven’t had a contingent election since 1824, though there have been electoral vote disputes. But in a lot of the hypotheticals tossed around in the present election, a third-party candidate could conceivably create a scenario with a plurality but non-majority of electoral votes. Stay tuned. The 12th Amendment sets up contingent election process but is a little vague on timing and decision metrics. See also: the “Lame Duck” 20th Amendment to the Constitution, and the related Presidential Succession Act of 1947. If you really want to make that third-party statement, why not go for a Bull Moose Party shirt? 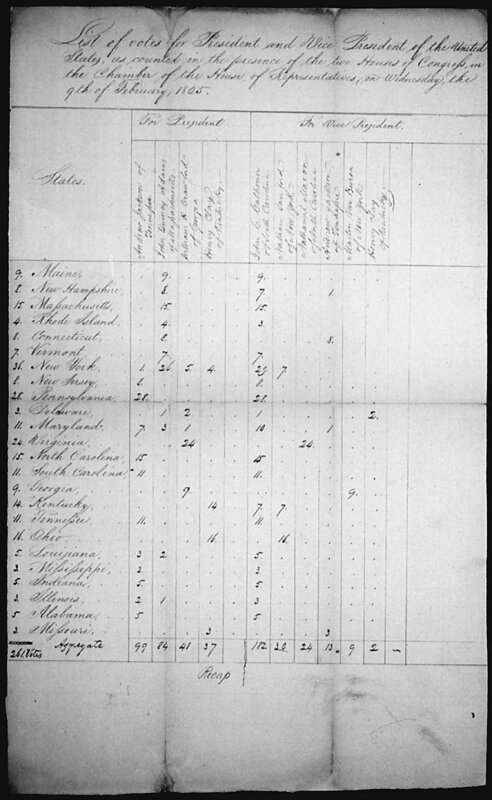 View the original tally of the 1824 Electoral College vote, courtesy National Archives. Must-read summary of contingent election from the Congressional Research Service. Great coverage on the 1800 election from the Library of Congress, Smithsonian and the Gilder Lehman Institute of American History. Was there a corrupt bargain? Historians may disagree, but economists say voting was on the up-and-up.